Help the Langa community keep its music & culture alive! The vast unending expanse of sand that makes up the Thar Desert of Rajasthan hosts one of the most vibrant and evocative music cultures of the world. The heady, hypnotic combination of rhythm and melodies sung and played by the Langas are part of the eternal appeal of this mysterious and wondrous land. The soulful, full-throated voices of this community have filled the cool air of the desert nights for centuries in a tradition that reflects all aspects of Rajasthani life. Songs for every occasion, mood and moment, and stories of legendary battles, heroes and lovers express a love for life through music that provides relief from the ills of the desert. Langa literally means 'song giver'. 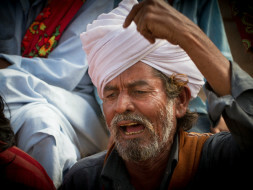 An accomplished group of poets, singers, and musicians from the Barmer district of Rajasthan, the Langas are said to have converted from Hinduism to Islam in the 17th century. Traditionally, Sufi influences prevented them from using percussion instruments; however, the Langas are versatile players of the Sindhi Sarangi and the Algoza (double flute), which accompany and echo their formidable and magical voices. The Sindhi Sarangi used by the Langas is made of four main wires, with more than twenty vibrating sympathetic strings that help create its distinctive haunting tones. The bowing of these instruments is a skillful exercise, and their sounds are often supported by the tinkle of 'ghungroos' or ankle bells that are tied to the bow to make the beat more prominent. More often than not, the Langas will speak of music being ‘in their blood’. As part of our series Better Days - we are proud to present 'The Langas', our 3rd Episode, as narrated by Nek Mohammed. Nek is among the few remaining Langa community members who still continue to practice traditional folk music and have been training new kids to carry forward the tradition. Since he relies on his art to bring home some money, maintain his music instruments, or even purchase new ones for his students, the meagre earnings make this a near impossible task. He currently has about 10 students and wants buy Sindhi Sarangis (Amazon link here) for all of them. The cost of each instrument is about 37,000 INR and we hope to support the purchase of at least 5 such instruments. Contribute now and help Nek Mohammed keep his tradition alive! Better Days is a 12-part web-series on the stories of inspiring common Indians. Produced by Bem Te Vi Producoes, In Association With The Better India & Times Now, Digital Partner - Facebook India.